The Miele company has been producing some of the world’s finest dishwashers for the past several decades. However, they’ve somehow managed to remain slightly under the radar when compared to other big-named dishwasher manufacturers across the globe. Even Miele dishwasher reviews often miss out on some of the most significant features that make Miele machines such a worthwhile investment. For starters, each and every Miele dishwasher is designed from the ground up to hold up to 20 years of regular use, a figure that doubles the ten years guaranteed by nearly every other dishwasher manufacturing brand. They also offer a wide range of features that are unique to Miele products, including specialized washing arms and uniquely designed racks that can be custom fitted for your individual washing needs. But what truly sets Miele designs apart is the commitment to quality and high-end design that’s present in every model—from lower range products in the Futura Classic series to the top-of-the-line pieces in Miele’s flagship Futura Diamond line. Using Miele products is a pleasant and stress-free experience that’s often missing in home appliances from other brands. The following three products are what we consider to be the best bets when choosing which Miele dishwasher is right for you. We’ve covered all the bases by highlighting one value selection, one great all-around choice from the middle of the Miele range, and one product that represents the absolute pinnacle of Miele product design for those that want nothing but the best. 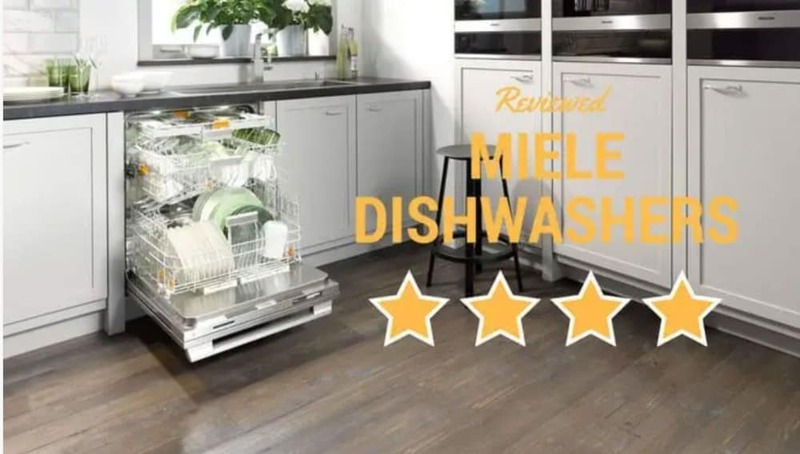 This guide goes beyond simple Miele dishwasher reviews—it’s a range that covers the full spectrum of Miele designs so that you can make an informed decision about your next dishwasher purchase. This impressive entry from Miele earns our top award thanks to its unique combination of features relative to the associated price tag. It’s designed to feature all of the elements that make all Miele products great, including 9 unique wash programs plus additional custom settings, enough space to hold a simply astonishing 16 complete place settings in a single load, and an extra-quiet operating noise level that stays just below 40 decibels (the relative volume of the average library). Additional features like the built-in water softener, China and Crystal settings and an AutoOpen door design that will automatically open itself at the conclusion of a cycle in order to help speed along the drying process of your dishes. The G6745SCUCLST also boasts an express cycle for quick washing of lightly soiled dishes as well as a half load cycle for smaller loads, designed to save water and energy. Boasting the lowest price in the entire family of Miele product models, you can rest assured that this excellent-value design can still provide all of the top-notch features and dependable traits that make Miele products so distinctive. That includes ultra-quiet operation atonly 45db, enough storage space for 16 full place settings, and a visually striking built-in stainless steel design with a minimalist aesthetic that’s perfect for modern and contemporary décor. Alongside the five traditional wash cycles included in the machine, AutoSensor technology allows this dishwasher to customize wash cycles based on the size of the load and the amount of soiling. The included, patented Miele cutlery tray is a cut above the traditional designs you’re used to that toss all of the cutlery into disorganized cups, opting instead for a top-rack tray that keeps each piece separated and safe from scratching. Overall, the G4227SCUSS is the most affordable and most impressive value-level dishwasher available from the Miele product line. If you’re looking for an opportunity to add the absolute peak of Miele design to your kitchen appliance collection, there’s no better choice than the Miele G6987 SCVi K2O with patented Knock2Open functionality included. In addition to boasting a laundry list of all the best Miele features like ultra-quiet operation, huge capacity for large dishwasher loads, an endless list of custom cycles for every situation, and an ultrasleek design that’s at home in any modern or contemporary living space, this Miele masterpiece takes things a step further. The Knock2Open feature means that all you need to open the machine is two quick knocks on the front surface. This allows for the function buttons to be kept out of sight until you’re ready for a cycle. The G6987 SCVi K2O also offers interior illumination via Miele BrilliantLight technology as well as Miele’s coveted AutoClose feature. The MaxiComfort basket design is unmatched in the industry, and every element of this gorgeous piece of engineering is designed to wash dishes with flawless functionality, durability, dependability and style. If you want to wash your dishes in the best machine available on the market—anywhere—then consider the Miele G6987 SCVi K2O Futura Diamond. Each individual has their own unique needs for dishwashing, as well as their own budget, priorities and volume of dishes based on use and family size. For this reason, we suggest that you explore Miele dishwasher reviews before making a choice on your next machine. Commit to making an informed decision, and you’ll be rewarded with 20 years of high-end dishwashing quality to make your life easier and more hassle-free. Once you pick the Miele machine that’s right for you, Designer Appliances can ship nationwide to wherever you are. Our experts are also always standing by to provide you with all the information and guidance you need in order to make an informed decision about the dishwasher that’s right for you.